Since I began my journey more or less with Ozu, it was a nice feeling to complete a circle of sorts and end my trip (more or less) by making a visit to the Seishunkan in Matsusaka (Mie prefecture). seishun means youth and the seishunkan is a museum dedicated to the period of the great Japanese filmmaker’s youth (from age 9 to 19, approximately) that he spent in Matsusaka. 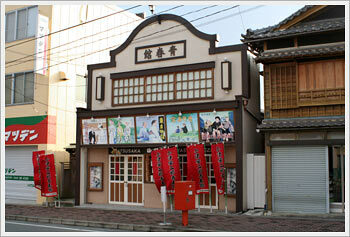 The museum is housed in a small building made to represent an old-time small town Japanese movie house, and was built on the site of the former Ozu family home (razed in a 1950s fire). I’m not sure how many visitors they get, as it was clear that the person working there made some calls while I was watching the introductory video and shortly after two older gentlemen who would not have been out of place at a San Francisco beatnik cafe showed up. I’m not exactly sure how they were affiliated with the museum (they seemed to have more access than volunteers), but they proceeded to spend the next hour giving me a personal tour of the exhibits and digging out all manner of albums and diary copies and scrapbooks, and regaling me with all sorts of stories about Ozu’s youth. (I wanted a Japanese workout on this trip and I sure got one today.) I really am indebted to the kindness shown by these gentlemen. It was appropriate that the man who did most of the talking reminded me of my former teacher who first introduced me to Ozu’s beauty. I’m really glad I made the effort to make it there, as out of the way as it was, though I regret that I didn’t allow more time to explore the town itself (there’s a map available from the museum which notes the places of significance to Ozu’s life).